Gil Stratton Jr. (June 2, 1922 – October 11, 2008) was an actor and sportscaster who was born in Brooklyn, New York. He most recently resided in Toluca Lake, California, until his death from congestive heart failure. Stratton was born June 2, 1922, in Brooklyn, New York, and attended Poly Prep in Brooklyn. He later attended St. Lawrence University in Canton, N.Y., where he graduated with a bachelor's degree, and starred as goalie of the SLU hockey team. He first became interested in acting as a teenager. He debuted on Broadway at the age of 19 as Bud Hooper in the George Abbott musical Best Foot Forward. The musical ran from October 1, 1941 to July 4, 1942. As a result of Stratton's appearance in Best Foot Forward, MGM hired him as a contract player. His first job for MGM was in the film Girl Crazy with Mickey Rooney and Judy Garland, singing "Embraceable You" in a duet with Garland. After completing Girl Crazy, he had a short film hiatus due to having enlisted in the United States Army Air Corps upon the US entry to World War II. He later noted that he ended up spending much of his service umpiring baseball. During this time he began umpiring for the Pacific Coast League (PCL). While umpiring in the PCL he began using the line, "time to call 'em as I see 'em." 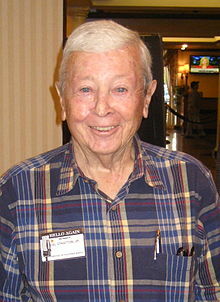 When Stratton completed his time with the Army, he returned to film, appearing in such features as Stalag 17 (1953) (as the narrator Cookie), a role in The Wild One (1953), and Bundle of Joy (1956). He starred in a total of 40 films during his film career, sharing the big screen with other notable actors such as Cary Grant, Shirley Temple, Marilyn Monroe, and William Holden. In addition to acting in several films, Stratton began working as a radio actor in the late 1940s, performing in such shows as Lux Radio Theater, The Great Gildersleeve, and My Little Margie He worked opposite Judy Garland in the 1950 radio adaptation of The Wizard of Oz, and acted opposite Shirley Temple in a radio version of The Bachelor and the Bobby-Soxer. In the 1954-1955 television season, Stratton starred on CBS as "Junior" Jackson in the situation comedy That's My Boy as a son pushed by his father to become a football star at their common alma mater. His co-stars were Eddie Mayehoff as his father, a construction contractors in the series, and Rochelle Hudson as his mother, Alice Jackson. Oddly, Hudson, cast as the mother, was only six years older than Stratton. In the 1950s, Stratton appeared in several episodes of Jack Webb's Dragnet. In the 1970s and 1980s he made occasional guest appearances on many television series, usually portraying a sports announcer. Stratton was hired by Los Angeles television station KNXT-TV (now CBS-2) in 1954 as a sportscaster and sports news anchor. He spent sixteen years as sports anchor of the show The Big News during the 1960s and 1970s. This was the first hour-long news program for the region. While there, he became recognized for his signature phrase "Time to call 'em as I see 'em", which he had started saying during his years as a baseball umpire. Within a year,"The Big News" was earning a 28 percent share in the Los Angeles ratings and the show format became the standard that was copied by other local TV stations across the country. Stratton was the last-surviving member of The Big News team prior to his death. He also served as a sportscaster for California CBS AM radio station, KNX 1070, from 1967 to 1984 and from 1986 to 1997 and for KTTV for a time in the 70's and 80's. While working for CBS Sports in both television and radio, he covered the 1960 Summer Olympics from Rome. He also covered the NFL as "the voice" of the Los Angeles Rams in the 1960s, and called Major League Baseball games, Kentucky Derbies, and feature races from Santa Anita, Hollywood Park, and Del Mar. He also covered many other sports, such as hockey, tennis, track and field and golf. MSNBC commentator Keith Olbermann worked with Stratton at both KCBS/KNXT and at KNX 1070. He said of Stratton, "There aren't many renaissance men in any age, but Gil was one of them." Stratton won five local Emmys during his television career, and was also awarded seven Golden Mike awards from the Radio-Television News Association. Stratton first retired from TV and radio in 1984, and traveled to the Big Island of Hawaii, where he became Owner/General Manager of a small radio station, 790 AM KKON, in Kealakekua, Hawaii. But being behind the desk was not for Stratton - he wanted to be behind the microphone again. Stratton sold the station to Bill Evans and returned again to KNX 1070 radio in 1986 as a weekend sports anchor. He retired again in 1997, but continued doing charity work, such as hosting many charity golf tournaments to raise funds for Henry Mayo Hospital in Newhall. The hospital later named a newborn nursery after him in appreciation of his work. He also taught classes in broadcasting at California State University Northridge. Stratton died on October 11, 2008, at the age of 86. ^ "Longtime L.A. sportscaster Gil Stratton dies". Los Angeles Daily News. Associated Press. October 13, 2008. Retrieved February 23, 2019. ^ a b c d e f g Thurber, Jon (October 13, 2008). "Gil Stratton Dies; Longtime Sportscaster was also an Actor". Los Angeles Times. ^ "Gil Stratton, Jr., Performer". Internet Broadway Database. Retrieved February 23, 2019. ^ > "Gil Stratton: Moving West to Moving Pictures". GilStratton.com. Archived from the original on 2008-10-16. ^ a b "Gil Stratton: A Pioneer in Sports Broadcasting". GilStratton.com. Archived from the original on 2008-10-17. ^ a b c d e f g "Iconic Sportscaster Gil Stratton Dead At 86". KCAL News. Archived from the original on 2008-10-16. ^ "That's My Boy". IMDb. Retrieved March 12, 2011. ^ a b "Veteran sportscaster-actor Gil Stratton dead at 86". Reuters. October 13, 2008. ^ "Los Angeles Radio People, Where are They Now?". LARadio.com.